Bahamian Artist Ritchie Eyma was born in Nassau in 1967 and grew up and was schooled in Haiti. Thus he had an opportunity to absorb the rich heritage of Haitian art, which far transcends the colorful primitive art familiar to tourists. As a child Ritchie wanted to be an architect. Watching with great delight a neighbour’s new house take shape, he would try to recapture with pencil and paper the shapes and emotions that exciting sight conveyed. With some influence from his uncle, who produced ceramics and charcoal drawings, Ritchie went about recreating his favourite comic books superheroes. He hung out at the National Museum of Art of Haiti as well as at the respected Nader’s Gallery, absorbing all he could. Art was becoming much more appealing than architecture. Ritchie began to take art seriously when he returned to the Bahamas at age 15, thanks to the devoted efforts of his high school art teacher at C.C.Sweeting, Sue Bennett-Williams. 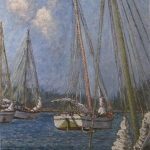 Under her guidance, he learned how to properly handle the various mediums such as acrylic, oil and watercolor. She was also instrumental in his taking the ‘A’ Level G.C.E. in art, which he passed in 1984. The recurring theme in Ritchie’s early paintings was the old style clapboard houses. 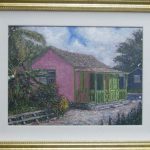 They reminded him of the little house scenes in the countryside favoured by Haitian artists. 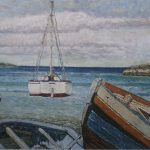 During the late 1980’s, he participated in the Annual Central Bank of the Bahamas Art Competition and the Longbranch Arts and Artisans Show. 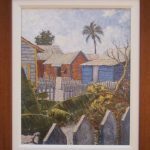 Recently, he was honored to have one of his pieces, “Fort Hill Houses” selected for the first Inaugural Exhibition of the National Gallery of the Bahamas in 2003. In 1998 Ritchie married his friend and fellow artist Roshanne Minnis. They have structured their lives to fulfill their twin loves: creating art and serving as volunteer pioneer ministers of Jehovah’s Witnesses, particularly to the Haitian community in Nassau. Ritchie also works as a freelance translator in Haitian Creole, French, and Spanish.